The Digitech DOD Looking Glass is a versatile true bypass overdrive guitar pedal. The lightest effect gives your sound a transparency with the enough drive to be noticeable. As the drive is increased the Looking Glass delivers a more brutish sound with plenty of tonal opportunities thanks to the bass and treble controls. The discrete FET Class-A design gives a touch responsive feel that decays naturally. The Looking Glass is accessible for all guitars with its input filter that can tame overly bright instruments for a sound that?s driven but not uncomfortable. 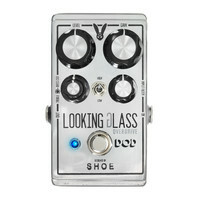 For those in need of an overdrive pedal that can do it all look no further than the Looking Glass.